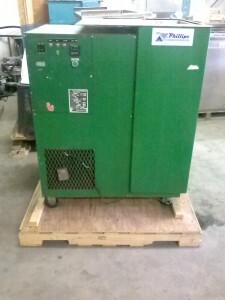 Check out our inventory of large vapor degreasers. SONICOR Model CUDR50S ultrasonic vapor degreaser; refrigerated chiller; all stainless construction; 2 sumps, 1 for ultrasonic cleaning, 1 for rinsing, sump dimensions – 10″ x 12″; total outside dimensions – 38″H x 22″W x 21″ back to front; primary refrigerated cooling; 230V, 1 phase; good & operating condition. 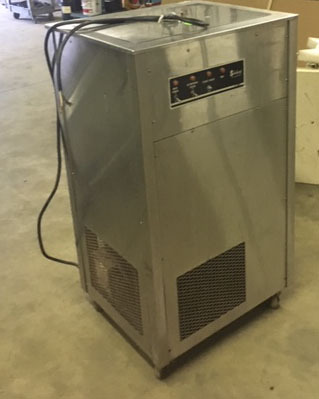 Low Emissions UltraKool Model # 1012 Vapor Degreaser; stainless construction; 230V, 1 phase; 2 sets of cooling coils – primary chiller cooling plus zero F. freeboard chiller cooling; 2 sumps -10” L x 12” W x 12” deep; outside dimensions – 45″ back to front x 52″ left to right x 54” high; sliding cover; no sonics; meets environmental regulations; condition – good & operating. CREST Mini Model F100-810; stainless construction; 208V, 1 phase; refrigerated primary cooling coils; 1 inside sumps – 10″ x 8″ x 10″ deep; overall dimensions -32″W x 26″L x 36″H; good & operating condition. 1 phase; 20 amps; 40 Khz ultrasonics; 100% freeboard and separate zero degree chiller; and extra set of cooling coils (zero degrees F.); inside sump dimensions – 10″ x 12″; spray wand; outside dimensions – 31.5″ x 27″ x 46.5″H; 9 gal. solvent cap. ; 3/4 hp refrigeration; 400 lbs. shipping weight; good and operating condition. ; 100% freeboard; stainless construction; 230V, 3 ph, 36 amps; ultrasonics; three sumps – all 12″ L x 10 – boil sump, ultrasonics sump & superheat sump; freeboard chiller; primary chiller; standard safety controls; water separator; spray wand; 12 gals solvent capacity; shipping weight – 1500 lbs; condition – good & operating. Stainless construction; 230V, 3 phase; immersion model; refrigerated primary chiller; below zero F. freeboard chiller; 40 Khz ultrasonics; 2 inside sumps – dimensions – 10″ x 12″ x 8″ deep; spray wand; outside dimensions – 55″L x 29″W x 47″H; solvent capacity.- 9.2 gallons; 3/4 hp refrigeration; 400 lbs. shipping weight; operating manual; good & operating condition. Stainless construction; 230V, 1 phase, 16.5 amps; 1 sump – 24″L x 14″W x 16.5″D; overall dimensions – 41.5″L x 26.5″W x 50.5″high; interior 35″ deep from top to basket grate; R134 refrigerated cooling; good & operating condition. Stainless construction; low emissions; 230V, 1 ph., 24 amps, 60 Hz; 100% freeboard and sliding cover; refrigerated (1HP) primary cooling coils; below zero freeboard chiller; 2 inside sumps (boil & rinse) – 12″ x 18″ x 12″ deep; overall dimensions -53″W x 42″ back to front x 48″H; mounted on heavy duty rolling carriage; good & operating condition. 230V, 1ph, 10 amps; refrigerated chiller; stainless construction; ultrasonic immersion type degreaser; 2 sumps; sump dimensions – 8″ x 11″ x 7.25″; overall dimensions – 26″ x 16″ x 46″ high; 5 gals solvent capacity; spray wand; shipping weight – 240 lbs. ; good and operating condition. Vapor/spray type; stainless construction; 100%+ freeboard; freeboard low temp chiller; primary chiller; one inside sump 21″ x 12″ x 18″ deep; stainless tight sliding cover; outside dimensions 32″ L x 33″ W x 42″ high; manual spray wand/foot pedal; solvent capacity 10 gallons; shipping weight -500 lbs; operating manual; good and operating condition. White room type; inside dimensions – 2 sumps – 10″ 12″ x 10″ deep; vapor zone above sumps; outside dimensions – 32″L x 16″ W x 45″ H; 230V, 1 phase, 20 amps; stainless construction; stainless cover; manual spray wand/foot switch; refrigerated primary chiller; good and operating condition. Stainless construction; refrigerated cooling; 230V, 1 phase; 25 amps; water separator; outside dimensions – 26″ x 22″ x 51″H; 22 gal. solvent cap. ; 240 lbs. shipping weight; good & operating condition. 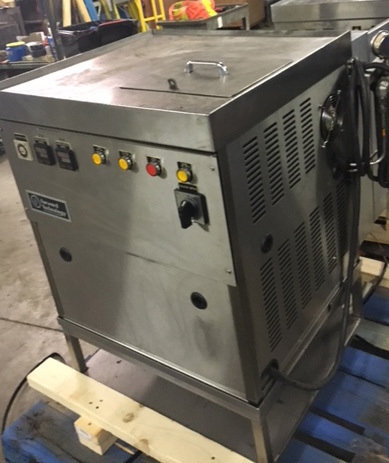 Vapor/spray type; stainless construction; primary chiller; one inside sump 21″ x 12″ x 18″ deep; stainless tight sliding cover; outside dimensions 32″L x 33″ W x 42″ H; manual spray wand/foot pedal; solvent capacity 10 gallons; shipping weight -500 lbs; operating manual; good and operating condition. 208v, 3 phase; 2 sumps – 12 x 12″ x 12″D; outside dimensions 43″ L x 33″ >W x 52″ H; 100%+ freeboard; chain driven sliding cover; primary chiller; freeboard chiller zero degree; condition good and operating. #2 retrofitted; stainless construction; 115v, 1 phase; 100% + freeboard; primary chiller refrigerated (1/2 HP); freeboard chiller zero coil; immersion model; (2) inside sumps- 10″ x 12″ x 10″; sliding cover; outside dimensions – 32″L x 36″W x 52″H; refrigerated water separator; manual spray wand/foot pedal switch; operating manual with machine; good and operating condition. Ultrasonic vapor degreaser; inside dimensions – 2 sumps – 10″ 12″ x 10″ deep; outside dimensions – 32″L x 16″ W x 45″ H; 230V, 1 phase, 20 amps; stainless construction; stainless cover; manual spray wand/foot switch; water cooled; good and operating condition. Immersion vapor degreaser; power – 115V, 1 phase; stainless construction; 2 inside sumps – 8″ L x 7″ W x 7.5″ high to top of weir; working area from sump bottom to just below cooling coils – 14″; also 9″ x 8″ offset boil sump; outside dimensions – 50″ L x 21″ W x 38″ high; condition – good and operating condition. Low Emissions; stainless construction; 115V, 1 ph. 25 amps; refrigerated (1/2 HP); immersion model; (2) inside sumps – 10″ x 12″x 10″ deep; 100+% freeboard with sliding cover; outside dimensions – 32″L x 33″W x 45″H; refrigerated water separator; manual spray wand/foot pedal switch; total weight – 475 lbs. ; operating manual with machine; good and operating condition. Stainless construction; 230V, 1 phase; 20 amps; immersion type degreaser; 2 inside sumps dimensions – 10″ x 12″ x 10″; spray wand; outside dimensions – 31.5″ x 27″ x 46.5″H; 9 gal. solvent cap. 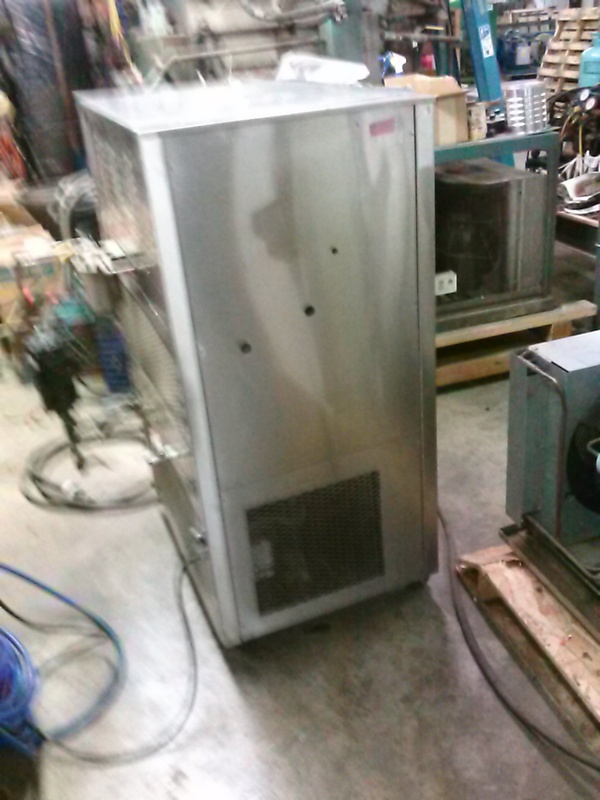 ; 3/4 hp refrigeration; 400 lbs. shipping weight; good and operating condition. Ultrasonic immersion model; 115v, 1 ph, refrigerated (1/2 HP); immersion model; (2) inside sumps- 10″ x 12″ x 10″; as liftoff cover; outside dimensions – 32″L x 33″W x 41″H; refrigerated water separator; manual spray wand/foot pedal switch; shipping weight – 475 lbs. ; operating manual with machine; good and operating condition. 115V, 1 ph, refrigerated (1/2 HP); immersion model; (2) inside sumps – 10″ x 12″ x 10″; ss liftoff cover; outside dimensions – 32″L x 33″W x 41″H; refrigerated water separator; manual spray wand/foot pedal switch; shipping weight – 475 lbs. ; operating manual with machine; good and operating condition. 1 ph; 1/2 HP refrigerated chiller; stainless construction; immersion type degreaser; 2 sumps – each dimensions 9″W x 12″L x 10″D; overall dimensions 38″ W x 40″ back to front x 45″ H; solvent capacity 12 gals. ; spray wand; water separator; good and operating condition. 1ph, 10 amps;HP refrigerated chiller; stainless construction; ultrasonic immersion type degreaser; 2 sumps; sump dimensions – 6.25″ x 9.75″ x 4.75″; overall dimensions – 22″ x 18.25″ x 38.50 high; 2 gals solvent capacity; shipping weight – 150lbs; good and operating condition. Ultrasonics; 115v, 1 ph, refrigerated (1/2 HP); immersion model; (2) inside sumps- 10″ x 12″; as liftoff cover; outside dimensions – 32″L x 33″W x 41″H; refrigerated water separator; manual spray wand/foot pedal switch; workload capacity – 530 lbs. per hr. ; total weight – 475 lbs. 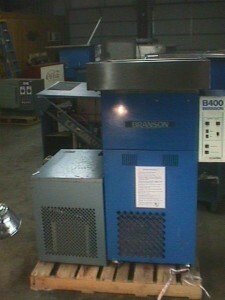 ; operating manual with machine; on casters; very good condition. 230V, 1 phase, 24 amps; stainless construction; water cooled; overall dimensions – 25″ x 22″ x 51″H; 8 gals per hour distillation; 10 gal. solvent cap. ; 240 lbs. shipping weight; condition – good and operating condition.